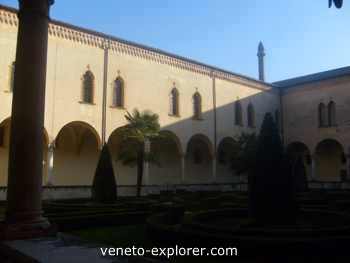 Medieval monasteries of Veneto, Italy. If you are one of those people who love to visit the medieval monasteries immersed in a restful countryside, making a short hop to the impressing Benedectine Praglia Abbey it’s just the thing. You will spend a spiritually relaxing day away from the crowds and dipped in a still unspoiled countryside of Veneto, in a landscape of stillnes and quietness. The ancient monastery is located 12Km/7.4miles from Padua, and it is even closer to Abano Terme, at the foohills of the lush Colli Euganei (Euganean Hills). The hills belong to a 18,000ha/44,480acres national park set up by the Region Veneto in 1989. The Euganean hills are a most favourite out-of-town excursions for the Padovani (Padua citizens). I love the Euganean hills too, with their unique shape. A bunch of round and pointy hills rising straight from the plain, as though a child had painted them. The medieval monastery is also a common destination for guests staying in the Thermal Spas of Abano Terme, one of the most renowned healing thermal bath in Italy. In fact the thermal spas are just a stone’s throw from the abbey, only 5km/3miles. 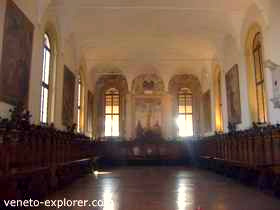 Like in many medieval monasteries around the world, in the Praglia Abbey there are rooms for guests available as well. Some people, as the abbot who guided us to the Abbazia tour said, after having been at the Abano Terme spas, decide to spend a few days in the Praglia Abbey for a spiritual retreat. After the therapeutic body treatments, it comes the ones for the soul. 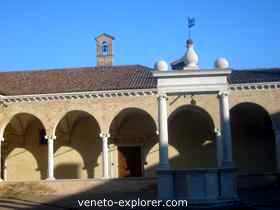 The original Praglia Abbey, one of the most worth seeing medieval monasteries of Veneto, was founded in the late eleventh century by the powerful Vicenza’s Maltraverso family. Over the centuries, in the Middle Ages and Renaissance times, it was remodeled and new parts were added. While approaching the monastery,one of the first things you'll notice is the big facade of the Basilica dell’Assunta, the Abbey's church built in the late 1400s’, towering over a wide and long steps. 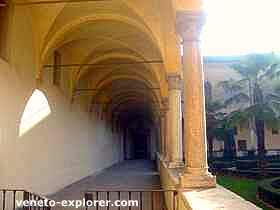 The guided visit starts from one of the four monastery cloisters, called the Rustic. Here there are both the guest rooms for those who want to make a spiritual retreat, and the centre for cultural activities. Note the columns alternated with red Verona and white Histria marble. Take a look at the elegant venetian-gothic style windows on the four cloister sides, framed above by a fine terracotta frieze. In the centre lies a 18th century well, still working.Today the original botanical cloister, once used to grow medicinal herbs, has turned into an italian style garden. The today's botanical garden is in another side of the monastery. The vaulted cloister on the upper floor is very beautiful, made of bright marbles and stones. At the centre of the cloister stands out a well, that is used to collect the rainwater, thanks to the slight slope of the floor. The Chapter room is where the abbots community gathers to read a chapter of the benedectine rule. There are still the original antiques such as the cherry wood benches all around. On the floor, some stone lids covers the pulverized remains of the abbots that have passed away. 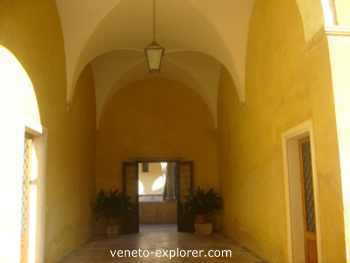 Also noteworthy for their artistic value are the lavaboes and the doors all around the cloister arcades, made of finely decorated Histria's marbles and wood. The stunning monumental Refectory is where the abbots used to dine in the past. Here you can admire the original walnut wood benches and the huge solid wood table, in turn a precious piece of antique. 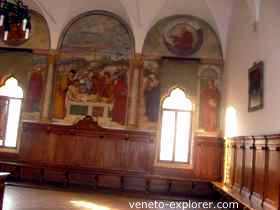 Nowadays the monks use another dedicated room as a dining hall, because in this one there is neither heating nor air conditioning. Too cold in winter, too hot in summer. Even the benedectine monks keep up with times. Our guide explained to us why the refectory floor, which is made of stone, is so warped: during the second world war, a lot of people would stash their precious artworks inside the abbey, to keep them safe from bombing and plundering. It ended up being tons of piled stuff. Even the very ancient 4 horses of the San Marco Basilica dating back to over 2000 years ago were taken to the monastery, in the basement though. Finally, while in the upper cloister, take a look at the Loggetta Belvedere, a nice terrace from where you can feast your eyes on the lush Euganean hills and the monastery’s vine groves, garden and orchards. The monastery is well renowned for being one of the top books restoration centers of Italy. During the 1966 Florence flood many books were sent there to be restored. At the upper floor there is also a 16th century library, which currently houses about 100,000 books. At the main entrance to the medieval monastery, on the ground floor, you can indulge yourself and buy some of the products of the monastery’s botanical garden, such as toiletries, cosmetic and herbal medicine products, along with different varieties of honey obtained from the abbey’s apiary. From Venice: take the A4 highway Milano-Venezia. Exit in Padova Ovest. Drive toward Terme Euganee, and then to the Colli Euganei(18Km/11miles). From Milan: take the A4 highway Milano-Venezia. Exit in Grisignano. 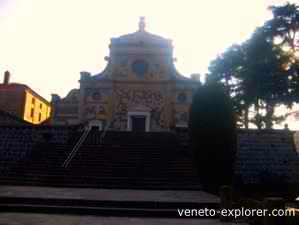 Drive toward Montegalda, Cervarese, Montemerlo(18Km/11miles). From Bologna: take the A13 highway Padova-Bologna. Exit in Terme Euganee, drive toward Montegrotto Terme, Colli Euganei, Monterosso(14Km/9miles). From Padua station: take the bus to Teolo, Vo’ Euganeo, Noventa Vicentina. No booking required, except for schoolchildren groups (ph. 049 - 99 99 300).